BRUSSELS—A noted pro-Azerbaijani lawmaker from Spain was elected the president of the Parliamentary Assembly of Council of Europe on Monday ahead of the organization’s winter session, which is scheduled to begin Tuesday. The head of the Armenian delegation to PACE, Hermine Naghdalian was elected vice-president of PACE during the same session. She will be one of 20 vice-presidents that were elected representing various PACE-member states. Pedro Agramunt, a Spanish lawmaker and the chairman of the European People’s Party at the Council of Europe (EPP-CD) Group, will replace Luxembourgian lawmaker Anne Brasseur as the president of the Parliamentary Assembly of the Council of Europe. Last year he was the rapporteur on the functioning of democratic institutions in Azerbaijan, with human rights organizations accusing him of bias in his approach to Azezrbaijan. In June, The Economist cited a report prepared by the European Stability Initiative in which Agramunt was described as an ally of Azerbaijan. “There are very few fellow members of the Parliamentary Assembly of the Council of Europe (PACE) who have been to Azerbaijan as regularly over the past decade as Pedro Agramunt, the conservative Spanish senator, a businessman from Valencia. Agramunt has been consistent in this approach to Azerbaijan: from the very beginning of his relationship with Baku he has been a defender of the Aliyev regime. The latest monitoring report is his masterpiece,” the ESI report stated. During the autumn session of PACE, Agramunt emerged as a proponent of a resolution adopted by a sub-committee, which was authored by British Member of Parliament Robert Walter, whose report was pro-Azerbaijani and in the summer was granted Turkish citizenship. Following the passage of the resolution and another, which centered on the use of the Sarsang Reservoir in Artsakh, the OSCE Minks Group co-chairmen warned international organizations to not interfere in the Karabakh conflict resolution processes. The co-chairmen issued a similar rebuke to PACE last week. During a press conference on Monday, Brasseur announced that the final decision whether to hold the discussions would be decided by the Assembly. “Armenia and Azerbaijan are Council of Europe member states and we must find solutions so that people live in peace. To succeed in this goal, we must work strenuously, as people in that region are suffering. They are Council of Europe citizens, their rights must be defended, and we have to find ways. The issue must find a solution. My personal opinion is that we must not leave things the way they exist today,” said Brasseur. 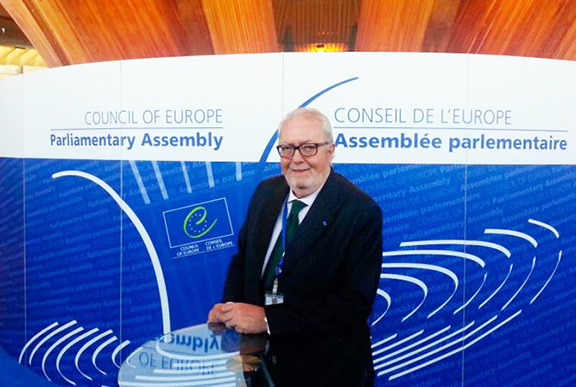 The President of the Parliamentary Assembly of the Council of Europe is elected for one year by majority of votes and can be reelected once. ARMENIA MUST BE MORE ACTIVE BEFORE ANY RESOLUTION GOES FOR DISCUSION ,OR VOTING, ITS TIME TO PRINT AND SHOW THE REAL FACE OF CORRUPTED EU POLITICIANS IN THE MAJOR EUROPIAN MAGAZINES AND MEDIA , LIKE LOMOND , GUARDIAN … AND SO ON …..
First off, to hell with Europe and all of the Europe-based internationalist organizations – nothing but groupings of neo-Marxist jackals with a Turkish-Islamist fetish and a fixation on destroying the Orthodox Christian world, particularly Russia, Serbia, and Armenia. I would honestly expect nothing less than all top European officials being Matthew Bryza status harlots for the Azeri and Turkish governments. I trust that President Sargsyan’s administration will handle the Euro-clowns with no problems. We may dislike the Complimentary Politics policy, but Armenia so far has prevented Europe from inflicting any serious damage. What really irks me is that there are still so many clueless Armenians who dream of Armenia becoming an EU member. It should be clear to anyone of average intelligence that 1) Europe is by nature pro-Turkish, 2) Europe cares more for Azeri gas and oil than any abstract concepts like democracy or human rights, and 3) European organizations are destroying their own nations, what makes us think they would spare Armenia? How many anti-Armenia and anti-Artsakh reports does Europe need to produce before Armenians lose their famous tempers and collectively tell Europe to get? How many hypocritical condemnations from Europe of elections and other manifestations of democratic self-government held in Artsakh do Armenians need to endure? How many more anti-Armenian fascists like Mevlüt Çavuşoğlu get to be elected to head these European organizations before Armenians understand that “western values” are a great lie? How many more Safarovs will get away with murder due to European corruption? How many more times does Europe have to tell Armenians that the alleged genocide of Jews during World War II is given sacred status protection by European anti-heresy laws, while at the same time racist bigots are free to make up all of the lies they wish regarding the genocide of Armenians during World War I? The west is a lost cause, they have proven their anti-Armenia nature from the British and French defense of Turkey during the Crimean War, to the French sale of Cilicia to the Turks, to the Cold War until today when we see NATO and the United States provide Turkey with all sorts of advanced military weapons (F-16 fighters, Leopard II tanks, Patriot missiles and even shared access to nuclear weapons based in Turkish-occupied Cilicia). The ONLY ally Armenia has is Russia. God Bless Russia, God Bless Armenia, and God Bless the Russia-Armenia Strategic Alliance and protect it from all enemies, foreign and domestic. I agree with you. I used to be one of these Armenians that didn’t see the truth about Russia. I have made a lot of research in history about the world wars, Russia and global politics. I am awake now. Russia is our greatest ally. Russia is Armenia’s greatest ally. We must do everything in order to preserve this alliance. We cannot trust the political West. They will backstab us in the back. I hope a lot more Armenians will realize that the West is not trustworthy. We don’t need fake “european” values in Armenia. We need a Christian Armenia allied with Russia. That is the most important thing. Politicians are making killings by capitalizing on Azerbaijan’s wealth, the day Oil and Gas revenues deplete all these a.s holes will disappear.